When MAD was turned into a magazine, every publisher and his uncle came up with his own version using many of the same artists and writers as well as other top-ranking comic book creators. In Behaving Madly you will find rare, never before reprinted material by such industry greats as Bill Elder, Jack Davis, John Severin, Joe Maneely, Ross Andru, Joe Kubert, Russ Heath, Bob Powell, Howard Nostrand, Lee Elias, Basil Wolverton, Joe Sinnott, Don Heck, Ric Estrada, and Al Jaffe. Rare, complete stories by Jack Kirby and Steve Ditko are included at the same price. A special section at the end of the book is devoted to the way MAD reacted to these imitations and the many ways they took on their main competitor themselves. Selected and introduced by Ger Apeldoornand Craig Yoe, Behaving Madly covers every MAD Magazine imitation between 1955 and 1959, from Snafu, Lunatickle, Cockeyed and Crazy, Man, Crazy to Think, Frantic, Frenzy, Loco, Panic and Zany, as well as a thoroughly researched introduction on the whole field, which will be seen as the final word on the subject. But Behaving Madly is more than a must-have collection. It is also a fresh and funny look into the culture of yesterday, littered with big names and even bigger yucks. You'll see Edward E. Murrow interviewing Marilyn Monroe, Elvis Presley as an alien, Walt Disney pestering wild life, and spoofs, imitations, and parodies of everyone from Alfred Hitchcock to Ernest Hemingway. If all this wasn't enough Behaving Madlyincludes an amazing revelation! Yoe says, "This surprising and never before known fact is sure to shake both the comic and Fine Art world!" For the first time Behaving Madly reveals the previously unknown source for Roy Lichtenstein's famous, most widely seen painting, Pistol. Pistol (1964) was appropriated from a MAD knock-off, Panic #3 (Nov. 1958), and a magazine, Time, then, used a version by Lichtenstein for their controversial cover on their "The Gun in America" issue (June 21, 1968). The image was taken by Lichtenstein from from a magazine to make a Pop Art painting and then went into back to a magazine completing the circle. Ger Apeldoorn is a comic book historian who wrote about Mad comic book imitation and Harvey Kurtzman for Alter Ego and has been running the popular The Fabulous Fifties blog for more than eight years. It is visited daily by many artists and collectors and often referred to in the Comic Journal's weblog. In December, Alter Ego will use his study on the efforts of Stan Lee to get out of comics between 1956 and 1962 as its cover article. Craig Yoe is a two-time Eisner winner and legendary editor and packager of the Yoe! Books line of reprints at IDW. His books have covered subjects ranging from horror, to romance, to kids comics. His book, Super Weird Heroes, is a best-seller and a sequel is in the works. They first met when Ger on his blog shared some rare scans of Milt Gross' silent movie reviews and it was love at first sight. Behaving Madly is the duo’s joint love letter to the art of graphic satire and took them both more than five years to produce. Both are willing to be interviewed, probed, and paraded around for the entertainment medium of your choice. 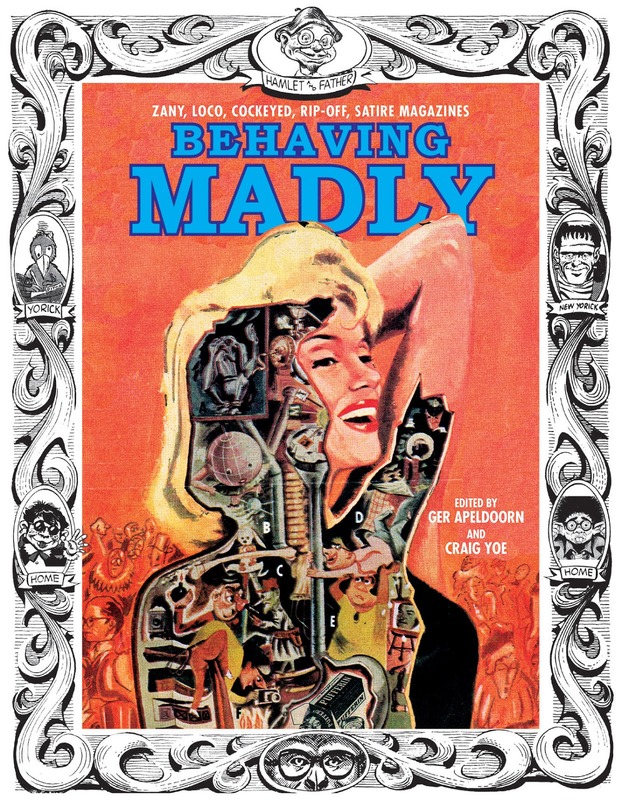 You can find them signing copies of Behaving Madly during San Diego Comic-Con at the IDW booth (#2743) on Friday, July 22nd from 1-2pm. View the book trailer for Behaving Madly here.